"Among the hills from which the Sutlej and Ravi flow, are chiefs who bear the name of Raja, mostly of Rajput descent and whose pedigrees stretch back in unbroken succession for several thousand years … Dynasty after dynasty has ruled in Hindustan and past away. Two creeds, strong to conquer and foreign to land, have been prominent from the Bay of Bengal to the passes of the Khaibar. But, before Mahomed, God-intoxicated, shattered the idols of Arabia; before the founder of the Christian faith gathered his few disciples by the Lake of Galilee, the little Rajput Principalities were existing in their quiet valleys; and when the day arrives that the name of little England shall be no longer a power in Hindustan, but only a vague memory, one leaf of her long and wondrous story, the Rajputs will still be ruling their ancient valleys and tracing back their ancestry to the sun" - L H Griffith, Rajas of the Punjab. At the proclamation of Queen Victoria as Empress of India in 1877, over 700 princely states and territories enjoyed treaty relations with the British Crown. The exact relationship between the Government of India and these states varied enormously, ranging from treaties of alliance, defence, protection, or supervision to almost outright control. The degree of control exercised by the British authorities varied in accordance with the engagements entered into by the rulers and the former governing authority, the Honourable East India Company. The British Crown assumed these rights from the HEIC in 1857 and exercised, what became known as "paramountcy" in respect to the internal government of the rulers. The representatives of the Government of India supplied the states with advice, technical expertise, loans and finance, and served as a means of communication with others princely states. The rulers, in turn, acknowledged the sovereignty of the King-Emperor, and in many cases, were bound to supply military forces for the defence of the Empire. So long as good government and loyalty were maintained by the princes, little direct interference was exercised by the paramount power. Persuasion, cajolery and blandishment, making direct intervention unnecessary. Needless to say, the form of government that this engendered was without parallel in history. Amongst these development of the nineteenth century stood the imposing Queen, Victoria. Her example, concern and genuine interest in India and her welfare touched a cord with Indians in all ranks of society. Her assumption of the Imperial title in 1877, seen as a natural outcome of the personal, yet remote, relationship that had been developed over the past quarter century. Henceforth, the princes of India would see Victoria and her successors as their sovereign, to whom they gave their loyalty. Public demonstrations of this were amply given in the various wars in which Britain engaged and in the Durbars arranged at Delhi and elsewhere. Begining with the Proclamation Durbar in 1877, and repeated with increased ceremony and grandeur at the Coronation Durbar of 1903 and culminated in the magnificent spectacle of 1911. The King-Emperor George V and Queen-Empress Mary attended the 1911 Durbar in person, an unprecedented event in both Indian and Imperial history. Practically every ruling prince, nobleman and person of note, attended to pay obeisance to their sovereign, in person. The Sovereigns appeared in their Coronation robes, the King-Emperor wearing the Imperial Crown of India with eight arches, containing six thousand one hundred and seventy diamonds, and covered with sapphires, emeralds and rubies, with a velvet and miniver cap all weighing nineteen and a half ounces. They then appeared at a darshan (a sight) at the jharoka (balcony window) of Red Fort, to receive half a million or more of the common people who had come to greet them. 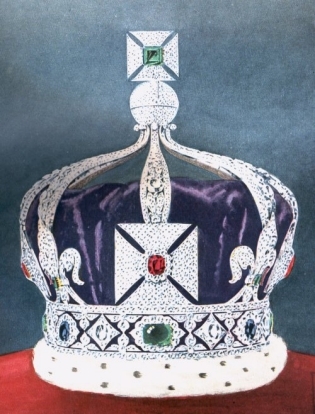 The Imperial Crown of India, used by George V at the Coronation Durbar, Delhi, 1911. The dawn of the twentieth century saw a gradual change emerge in response to increasing demands for self-rule. Afghanistan was recognised as an independent kingdom after the third Afghan War in 1919. Nepal was similarly recognised in 1921, as a consequence of the enormous contribution rendered by the soldiers of that country to the Imperial war effort. Constitutional developments were put in place within India proper during the 1920s. Initially, the provinces of British India were granted a measure of responsible government. Further proposals envisaged the eventual establishment of a self-governing Dominion; not dissimilar from those previously established in other parts of the Empire, such as, Canada and Australia. Similar to those countries, a federal framework was passed into law in the Government of India Act of 1935. This allowed for the voluntary accession of the princely states, either in union with adjacent existing provinces of British India or, as separate self-governing units within the federation. In preparation for the new federation, and as a consequence of constitutional developments in those states, Burma and Aden were separated from the Indian Empire as distinct Crown Colonies in 1937. A number of states and protectorates contiguous to those colonies thereafter ceased to be the responsibility of the Government of India and came under the supervision of the local colonial authorities. Ten years later the British Government announced its intention to relinquish responsibility for the Indian Empire by June of 1948. Two separate Dominions were to be formed out of the British Indian provinces of Assam, East and West Bengal, Bihar and Orissa, Bombay, the Central Provinces, Madras, the Punjab (soon partitioned between East and West), the North West Frontier Province and the United Provinces. The new Dominions of Pakistan and India were broadly formed on the majority religious grouping within these provinces. The British authorities unilaterally cancelled the treaty relations enjoyed by the princely states at midnight on 14th August 1947; the date set for the granting of independence to the new Dominions of India and Pakistan. The Paramountcy, hitherto exercised by the Viceroy, lapsed at that date. The rulers of the princely states were encouraged to accede to either one of the dominions of their choice, under the formula adopted in the abortive federal constitution of 1935. Some 730 states chose to accede to the Dominion of India by the date of independence. Two states, Bhutan and Sikkim, became Indian protectorates. Three other states, Hyderabad, Jammu and Kashmir, and Junagadh, failed to accede to either dominion. Jammu, together with parts of Kashmir were incorporated into India after the Maharaja was forced to seek Indian military intervention. The remaining parts of Kashmir, which were controlled by mujahiddin elements, being incorporated within Pakistan. In time, the two remaining states of Hyderabad and Junagadh were to be incorporated by force of arms. During the period 1948-1950, some of the princely states that joined India were either incorporated into existing former provinces of British India. Most of the others were formed into unions of new states, or if large enough, single unit states. The senior ruling prince within the union was usually appointed to the new position of Rajpramukh, an appointment designed to be for life. In return for surrendering the government of their states, together with their revenues and military forces, the former ruling princes were guaranteed their hereditary styles and titles, certain privileges of rank and honour, as well as privy purses to cover the living expenses of themselves and their families. The guarantees and undertakings given by the Union government of India were gradually withdrawn over a twenty-year period after independence. By 1956, the system of voluntary unions of states was dismantled and the position of Rajpramukh abolished. New states were created along linguistic and ethnic lines, which tore apart the traditional ties that existed in the former princely states. As the princely rulers died out, more and more time was being taken before their successors were recognised by the Government of India. When they were recognised, this was usually after they were persuaded to accept lower privy purses or reductions in privileges. The successful entry of several prominent princes and members of their families did not always endear them to the governments of democratic India. Eventually, the government of Mrs Gandhi tired of their increasing involvement in opposition politics and sought to curb their influence. The abolition of the privy purses, guaranteed by the Indian Constitution and the elimination of the princely order itself, became the policy of the Congress party. After a year-long battle, this was finally achieved by an amendment to the Constitution at the end of 1971. Although some parties have attempted to portray the constitutional changes as an abolition of the princely order, this does not appear to be the legal position. The changes merely removed official recognition of the position of "ruler", as defined by the 1950 Constitution, and enabled the ending of privy-purse payments. The amendments did not touch upon any aspects of the treaties and engagements made during the accession of the princely states, nor did they even address the matter of rights to styles and titles. Since then, there have been a number of decisions and cases of the Supreme Court of India, where the court itself has continued to use the styles and titles enjoyed by the princes, the nobility and members of their families. Some prominent examples are: "Colonel His Highness Sawai Tej Singhji, Maharaja of Alwar vs. The Union of India & Anr." (1978), "H.H. Sir Rama Varma vs. C.I.T." (1994), "The Commissioner of Income-Tax, Madhya Pradesh, Bhopal vs. H.H. Maharani Usha Devi" (1998), "Commissioner of Wealth Tax vs. Prince Muffakham Jah Bahadur Chamli Jan" (2000), "Her Highness Maharani Shantidevi P. Gaikwad vs. Savjibhai Haribhai Patel & Ors." (2001), "Union of India & Another vs. Raja Mohammed Amir Mohammad Khan" (2005). It is hard to imagine that the highest court in the land would have accepted the use of these titles had they been contrary to law. Due to the very large number of genealogies involved, the Indian indices have been broadly divided according to rank. I have used separate indices for the Salute states, Non-Salute states, Political Pensioners, the vassals of salute states, and zamindars. Detailed lists for these can be reached by using the following links.